Yeh Summer ki garmi ne aap sab ko bhi bohot hot hot kar diya?! KYUNNN! -Acha, sorry, I know kyun, par effect ke liye bol diya- :P LOL sorry for my horrible joke. See, from the beginning of this show, Swayam is shown as a shy boy, who doesn't talk to people much, and the only "friend" he seems to have is Bharat, right? *Correct me if I'm wrong* He's always been a kind of a loner, but he was HAPPY with what and who he was. But of course, from the beginning, he is shown to be in love with Sharon, and why not, she's a beautiful girl, but just with a bad attitude. 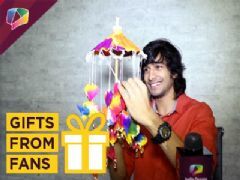 Anyways, my point here is that Swayam DOESN'T know how true friendship works because he's never really had THAT or THOSE kind of friends, like the Weeklings group now - he's now more comfortable talking to people, expressing his views and everything. He's slowly getting out of that shell and being himself. I don't want to say anything else, because I have written quiet an essay up there^, but I leave you with three videos - I love it, and I know you guys will love it too! Same song, same choreography, same people, same chemistry - no scratch that - better chemistry everytime they perform, and different costumes. They are so perfect together, ahhh!<3 I love this performance of theirs, it's just so so so good! Acha chalo, don't beat me up for this I was just trying to convey my thoughts! PS - someone please tell me how to embedd youtube videos onto this post? thanks! and than rey to aplogize too kriya!!.. hope the scene will be good.. but i dont want kriya too forigve him easily.. But yeah I totally agree with you. I don't hate Swayam. I actually like him. He is trying to come out of the box. He wants to express his thoughts. So we should just let him do what he should do. I think we will love his character very soon. However I kinda like the fights. This shows that people are different. I don't know if that make any sense to you. We people are very different and have different point of views. All the characters represent us, how we are, what we do etc...We get angry, happy, nervous, scared etc.. They just want to show us that nobody is perfect. We all make mistakes. This shows that we are very special. That's why there are a lot pranks and fights shown in this serial. I really like this serial. Yeah that's true. Sometimes too much of things are not good. However I like the fights and pranks because I don't see these type of pranks everyday. That's why I don't get bored and that's why I love this serial. But yeah you are right.